Description: ‘Burgundy Sunset’ has been granted Plant Breeders Rights in Australia and a similar cultivar discovered in New Zealand has been granted plant variety rights there and also patented in the USA under the name ‘Ebony’. 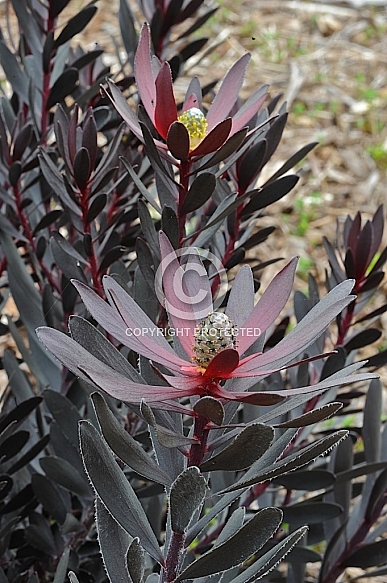 In both cases the plants have evolved from a ‘sport’ or mutation from a plant of Leucadendron ‘Safari Sunset’. The very deep, wine-red, almost purple-black colouring of the foliage is a defining feature when compared to the green foliage of ‘Safari Sunset’. The bracts are also much deeper in colour. Stem length is not as long as the parent plant, but will never the less be suitable for picking purposes. The peak flowering time for colour and picking purposes is during winter. The plant is slower growing and less vigorous than the parent and appears to reach dimensions of approximately 2 m high x 1.5 m wide. Frost hardy to at least -5 ºC, this new cultivar thrives in average to good, well-drained soils and in sunny positions. This photograph taken in late winter, at the most mature stage of the bracts when the seed cone is forming.